Onychomycosis is the name for nails that have been infected by a fungus. This causes discolouration of the nail so it has blotches of yellow to creamy white and often some darkening of the surrounding nail plate. The skin under the nail and the nail itself usually thickens and develops a white powdery appearance. Fungal nails can involve just a small portion of a single nail or the nails of all 10 toes. 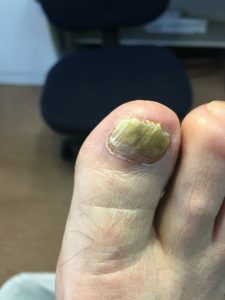 When using laser therapy to treat fungal nails our podiatrists will first make an assessment to determine if the discolouration is due to a fungal infection. To make this assessment a nail scrapping is often taken, sent to a pathology laboratory and the results obtained 4 weeks later. If there is a positive result from the nail scrapping laser therapy is commenced. The nails are first reduced and then a laser is applied. A second laser application is performed 2 weeks later. In addition to using the laser the podiatrist will advise the patient on the use of appropriate footwear, foot soaks and the application of a topical anti-fungal medication to each nail. The patient is usually reviewed every 2 months to assess the progress of clearing the infection and advise on the need for ongoing treatment. Most fungal nail infections take 12 months to clear completely because it takes that long for a nail to grow from the base to the front edge. Laser therapy is successful in treating fungal nails in up to 80% of cases.